Let's examine the video clip insertion with the help of the example. 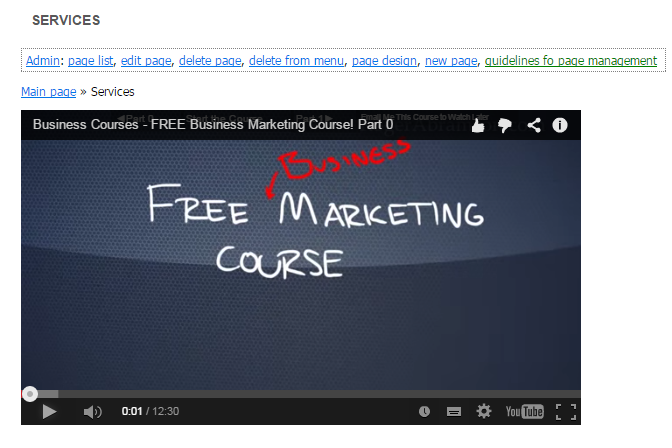 In this example we will insert a video clip in your website from the www.youtube.com websit. Select the necessary video. If you need to upload a new video, use the "Upload" option. After the selecting the video, go to the "Share", button, then to the "Embed" tab below. You can set the video size, and we recommend unchecking the "Show suggested videos when the video finishes". checkbox. After completing these instructions select the code and copy it. In the website management systems' upper menu, go to: "Design" - "Code insertions"
Click on the "Confirm saving" button. If this button does not appear, it means you didn't copy the Youtube code correctly; most likely you missed some of the code in the end of the code while copying it. 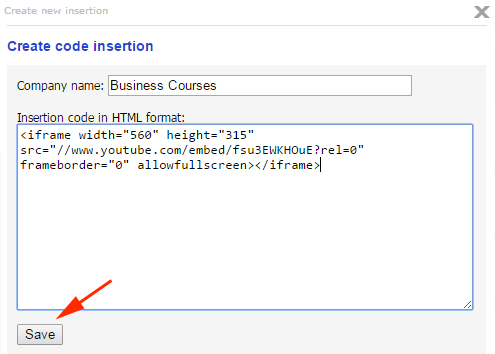 You have created a code insertion, and you can place it now wherever you need to in your website. In the "Tag" column opposite the name of the created code insertion select and copy the "Tag" field contents into the memory. There can be different numbers after the $INSERT code in the tag code, not only 1, а какой-то другой. 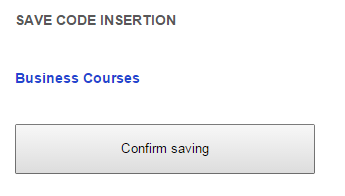 Go to the page that you want to insert the saved code into. Open this page in the editing mode. Place the mouse cursor in the necessary position and write the code tag (for example, $INSERT1). Please pay attention to the code – the letters must all be upper-case and contain no spaces. In point of fact the $INSERT1 code that was written by you informs the system that in this place instead of the $INSERT1 the system has to produce the code that you saved earlier by this tag number. Save the page, and instead of the $INSERT1 you will see your video clip.